It’s a ThinkPad. No, it’s a Yoga! No, it’s…a ThinkPad Yoga. Lenovo has melded two of its popular laptop design approaches together to create a sort of hybrid ultrabook, bringing together elements of its workhorseThinkPad lineup and multi-mode capable Yoga notebooks. It has the work-friendly keyboard design of the new generation of Lenovo ThinkPads, yet it also has that innovative hinge flexibility and multimode configurations of the Yoga series. The result is a laptop that’s either a more utilitarian, thicker version of the Yoga or a much cooler version of the ThinkPad. It sort of depends on if you’re a glass-is-half-full or glass-is-half-empty type. So which is it? We gave the Lenovo ThinkPad Yoga a close look and put it through the paces to see whether this machine offers the best of two worlds or something else all together. Like a lot of ultrabooks we’ve seen lately, the Lenovo ThinkPad Yoga sports an Intel Core i5-4200U chip, clocked at 1.6 – 2.6GHz (max turbo) with 3MB cache. The machine offers Intel HD Graphics 4400 with 4GB of DDR3 RAM and a 128GB SSD. The 12.5-inch display boasts a resolution of 1920×1080 with support for 10-point multitouch, and some models (including this one) come packing a stylus for pen input, too. There’s a 720p HD webcam and Intel Dual-Band Wireless-AC 7260 plus Bluetooth 4.0 for connectivity, and ports include a pair of USB 3.0, mini-HDMI, 4-in-1 card slot, headphone/mic jack, and a DC-in and Lenovo OneLink port. There’s also a power button on the side along with a volume and display lock and a tablet-style volume rocker. One port that’s noticeably absent is an Ethernet jack. That’s right, you’re flying with wireless only with the ThinkPad Yoga – which, frankly is pretty common these days for ultrabooks and not a deal breaker by any stretch. For audio, the machine has Dolby Home Theater v4 with enhanced VoIP audio. Finally, the machine weighs 3.52 lbs with a battery that purports to last up to 8 hours. 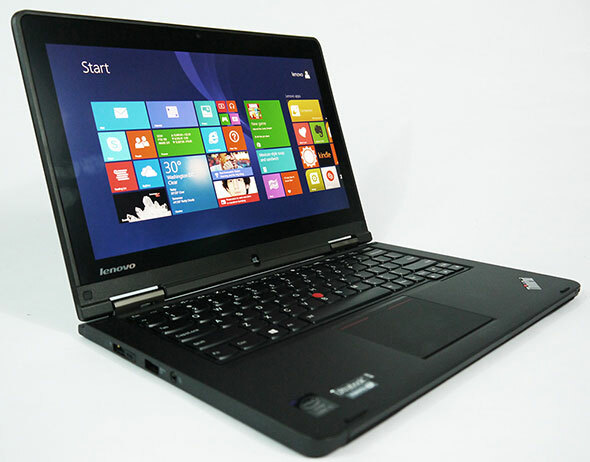 The ThinkPad Yoga is 0.74-0.76 inches thick and runs Windows 8.1 Pro. 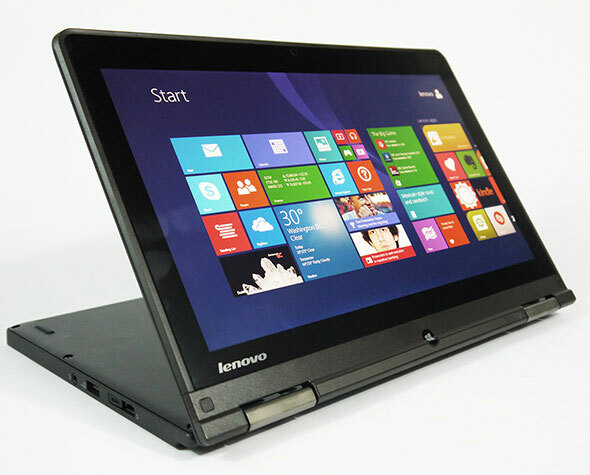 The Lenovo ThinkPad Yoga ultrabook retails for $999 as configured, currently. Let’s take a close gander at the design and build quality of this new breed of ThinkPad.